Key Difference: Shanghai and Beijing are both cities in China. Shanghai is one of the four direct-controlled municipalities of the People's Republic of China. It is a global financial center and a transport hub. Beijing, which is sometimes romanized as Peking, is the capital of the People's Republic of China. Shanghai and Beijing are both cities in China. While, Beijing is the political capital of China, Shanghai is considered to be the commercial capital of China. In fact, not only is Shanghai the largest city in China by population, it is the most populous city in the world, as it had a population of over 24 million in 2013. Shanghai is one of the four direct-controlled municipalities of the People's Republic of China. It is a global financial center and a transport hub. In fact, its container port is the busiest in the world. While, Shanghai had always been a major administrative, shipping, and trading town, it really grew in importance in the 19th century. This was mainly because Europe finally started recognizing the importance of the city’s favorable port location and economic potential. The city then became an important center of commerce between east and west, and by the 1930s had become the undisputed financial hub of the Asia Pacific. After the Communist Party takeover, trade with western countries declined, and Shanghai suffered. However, economic reforms were introduced in the 1990s for an intense re-development of the city, which aided in the return of finance and foreign investment to the city. Today, Shanghai is not only a popular commerce center, but a popular tourist destination as well. It is especially known for its historical landmarks such as The Bund, City God Temple and Yu Garden as well as the extensive Lujiazui skyline. The city is also known for its museums, particularly the Shanghai Museum and the China Art Museum. Shanghai is now termed as the "showpiece" of the booming economy of mainland China. Beijing, which is sometimes romanized as Peking, is the capital of the People's Republic of China. The city had a population of 21 million in 2013, making it one of the most populous cities in the world. Beijing is in fact the second most populous city of China, after Shanghai. In addition to being the capital, Beijing is the country’s political, cultural, and educational center. It has in fact been the political center of the country for most of the last eight centuries. Beijing houses the headquarters of most of China's largest state-owned companies. It is also a major hub for the national highway, expressway, railway, and high-speed rail networks. The city’s airport, the Beijing Capital International Airport, is the second busiest in the world as per passenger traffic. Today, Beijing is also a popular tourist destination. It is renowned for its opulent palaces, temples, parks and gardens, tombs, walls and gates. It is also known for its art treasures and universities, which have made it a center of culture and art in China. In addition, Beijing has seven UNESCO World Heritage Sites – the Forbidden City, Temple of Heaven, Summer Palace, Ming Tombs, Zhoukoudian, Great Wall, and the Grand Canal. "Pearl of the Orient" and "Paris of the East"
7th – 11th century. The earliest traces of human habitation in the Beijing municipality were found in the caves of Dragon Bone Hill dating to 230,000 to 250,000 years ago. Shanghai sits on the Yangtze River Delta on China's eastern coast, and is roughly the same distance from Beijing and Guangzhou. Shanghai has a humid subtropical climate (Köppen Cfa) and experiences four distinct seasons. Winters are chilly and damp, Summers are hot and humid. The most pleasant seasons are spring and autumn. The city is also susceptible to typhoons in summer and the beginning of autumn. Beijing has a rather dry, monsoon-influenced humid continental climate. It has hot, humid summers, and generally cold, windy, dry winters. Spring can bear witness to sandstorms blowing in from the Gobi Desert. Autumn, like spring, sees little rain, but is crisp and short. Like virtually all governing institutions in the mainland People's Republic of China, the politics of Shanghai is structured in a dual party-government system, in which the Communist Party Chief outranks the Mayor. Municipal government is regulated by the local Communist Party of China (CPC), led by the Beijing CPC Secretary. The local CPC issues administrative orders, collects taxes, manages the economy, and directs a standing committee of the Municipal People's Congress in making policy decisions and overseeing the local government. Shanghai is the commercial and financial center of mainland China, and ranks twentieth in the 2014 edition of the Global Financial Centres Index published by the City of London. By the end of 2009, there were 787 financial institutions, of which 170 were foreign-invested. In 2009, the Shanghai Stock Exchange ranked third among worldwide stock exchanges in terms of trading volume and sixth in terms of the total capitalization of listed companies, and the trading volume of six key commodities including rubber, copper and zinc on the Shanghai Futures Exchange all ranked first in the world. 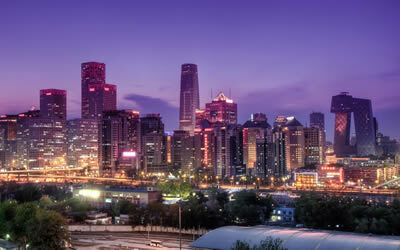 In the last two decades Shanghai has been one of the fastest developing cities in the world. Located at the heart of the Yangtze River Delta, Shanghai has the world's busiest container port. Shanghai aims to be an international shipping center in the near future. Beijing's economy ranks among the most developed and prosperous in China. In 2013, the municipality's nominal gross domestic product (GDP) was about 3.43% of the country's total output. The economy tripled in size from 2004 to 2012, and grew at an annual rate of 7.7% in 2013. Due to the concentration of state owned enterprises in the national capital, Beijing in 2013 had more Fortune Global 500 Company headquarters than any other city in the world. The city also ranked No. 4 in the number of billionaire residents after Moscow, New York and Hong Kong. In 2012, PricewaterhouseCoopers rated Beijing's overall economic influence as No. 1 in China. In 2006, the city government identified six high-end economic output zones around Beijing as the primary engines for local economic growth. Due to its cosmopolitan history, Shanghai has a blend of religious heritage as shown by the religious buildings and institutions still scattered around the city. According to a 2012 survey, 86.8% of the city’s population identifies as non religious or traditional faiths. The largest organized religious groups are Buddhists with 10.4%, followed by Protestants with 1.9%, Catholics with 0.7% and other faiths with 0.1%. Shanghai took the top spot in the 2009 and 2012 Program for International Student Assessment (PISA), a world-wide study of academic performance of 15-year-old students conducted by the OECD. Shanghai students, including migrant children, scored highest in every aspect (math, reading and science) in the world. The study concludes that public-funded schools in Shanghai have the highest educational quality in the world. Shanghai is the first city in the country to implement 9-year mandatory education. Shanghai has more than 930 kindergartens, 1,200 primary and 850 middle schools. Over 760,000 middle schools students and 871,000 primary school students are taught by 76,000 and 64,000 teaching staff respectively. Shanghai is also a major center of higher education in China with over 30 universities and colleges. Shanghai has an extensive public transport system, largely based on metros, buses and taxis. Payment of all these public transportation tools can be made by using the Shanghai Public Transportation Card. As of 2014, there are 14 metro lines (excluding the Shanghai Maglev Train and Jinshan Railway), 329 stations and 538 km (334 mi) of tracks in operation, making it the longest network in the world. Beijing is an important transport hub in North China with five ring roads, nine expressways, eleven National Highways, nine conventional railways, and two high-speed railways converging on the city. The Beijing Subway, which began operating in 1969, now has 17 lines, 227 stations, and 456 km (283 mi) of track and is the third longest subway system in the world and first in annual ridership with 3.21 billion rides delivered in 2013. There are nearly 1,000 public bus and trolleybus lines in the city, including four bus rapid transit lines. Shanghai is a major hub of China's expressway network. In the city center, there are several elevated expressways to lessen traffic pressure on surface streets, but traffic in and around Shanghai is often heavy and traffic jams are commonplace during rush hour. There are bicycle lanes separate from car traffic on many surface streets, but bicycles and motorcycles are banned from most main roads including the elevated expressways. Beijing is connected by road links to all parts of China as part of the National Trunk Road Network. Nine expressways of China serve Beijing, as do eleven China National Highways. Beijing's urban transport is dependent upon the five "ring roads" that concentrically surround the city, with the Forbidden City area marked as the geographical center for the ring roads. Traffic jams are a major concern. Even outside of rush hour, several roads still remain clogged with traffic. Shanghai has four major railway stations: Shanghai Railway Station, Shanghai South Railway Station, Shanghai West Railway Station, and Shanghai Hongqiao Railway Station. Three are connected to the metro network and serve as hubs in the railway network of China. Beijing serves as a large rail hub in China's railway network. Ten conventional rail lines radiate from the city. Beijing also has three high-speed rail lines: the Beijing-Tianjin Intercity Railway, the Beijing-Shanghai High-Speed Railway, and the Beijing–Guangzhou High-Speed Railway. The city's main railway stations are the Beijing Railway Station, the Beijing West Railway Station, the Beijing South Railway Station, and Beijing North Railway Station. Smaller stations in the city including Beijing East Railway Station and Qinghuayuan Railway Station. Beijing's primary airport is the Beijing Capital International Airport (IATA: PEK) about 20 kilometres (12 mi) northeast of the city center. The airport is the second busiest airport in the world. After renovations for the 2008 Olympics, the airport now boasts three terminals, with Terminal 3 being one of the largest in the world. Shanghai has a rich collection of buildings and structures of various architectural styles. The Bund, located by the bank of the Huangpu River, contains a rich collection of early 20th-century architecture, ranging in style from neoclassical HSBC Building to the art deco Sassoon House. In recent years, a large number of architecturally distinctive and even eccentric buildings have sprung up throughout Shanghai. Notable examples of contemporary architecture include the Shanghai Museum, Shanghai Grand Theatre in the People's Square precinct and Shanghai Oriental Art Center. Despite rampant redevelopment, the old city still retains some buildings of a traditional style, such as the Yuyuan Garden, an elaborate traditional garden in the Jiangnan style. The city also has some examples of Soviet neoclassical architecture. The Pudong district of Shanghai displays a wide range of skyscrapers, many of which rank among the tallest in the world. Three styles of architecture are predominant in urban Beijing. First, there is the traditional architecture of imperial China. Next, there is what is sometimes referred to as the "Sino-Sov" style, with structures tending to be boxy and sometimes poorly constructed, which were built between the 1950s and the 1970s. Finally, there are much more modern architectural forms, most noticeably in the area of the Beijing CBD and Beijing Financial Street. Beijing is famous for its siheyuans, a type of residence where a common courtyard is shared by the surrounding buildings. Beyond the Bund and Oriental Pearl Tower cityscapes there are a huge range of museums, colonial architecture, religious buildings, theatres, gardens, parks and shopping areas. The Old City is the original Chinese city going back about 1000 years. The International Settlement was built North and West of the Old City, starting in the 1840s. In colonial-period Western books, "Shanghai" means that settlement. T The Bund is the riverside avenue that was the center of 19th century Shanghai. Nanjing Road was the main street of the old British Concession; today it is a major upmarket shopping street. Other major sights are in the former French Concession. Jing'an Temple, Longhau Temple, St. Ignatius Cathedral, Temple of the Town God, Jade Buddha Temple and the Large church on the East side of People's Square in the old British district are some religious sites to be seen. At the historical heart of Beijing lies the Forbidden City, the enormous palace compound that was the home of the emperors of the Ming and Qing dynasties; the Forbidden City hosts the Palace Museum, which contains imperial collections of Chinese art. Surrounding the Forbidden City are several former imperial gardens, parks and scenic areas, notably Beihai, Shichahai, Zhongnanhai, Jingshan and Zhongshan. From Tiananmen Square, right across from the Forbidden City, there are several notable sites, such as the Tiananmen, Qianmen, the Great Hall of the People, the National Museum of China, the Monument to the People's Heroes, and the Mausoleum of Mao Zedong. The Summer Palace and the Old Summer Palace both lie at the western part of the city; the former, a UNESCO World Heritage Site. Among the best known religious sites in the city is the Temple of Heaven (Tiantan), located in southeastern Beijing, also a UNESCO World Heritage Site, as well as the Temple of Earth, the Temple of the Sun and the Temple of the Moon. Other well-known temple sites include the Dongyue Temple, Tanzhe Temple, Miaoying Temple, White Cloud Temple, Yonghe Temple, Fayuan Temple, Wanshou Temple and Big Bell Temple. The city also has its own Confucius Temple, and a Guozijian or Imperial Academy. The Cathedral of the Immaculate Conception, built in 1605, is the oldest Catholic church in Beijing. The Niujie Mosque is the oldest mosque in Beijing, with a history stretching back over a thousand years. Located at the outskirts of urban Beijing, but within its municipality are the Thirteen Tombs of the Ming Dynasty, the lavish and elaborate burial sites of thirteen Ming emperors, which have been designated as part of the UNESCO World Heritage Site. By the year 2012, the city has been operating 157 parks, with 138 of them free of charge. Some of the parks, aside from offering a green public space to the local, become popular tourist attractions due to their unique location, history or architecture. These include People's Square park, Fuxing Park, Zhongshan Park, Shanghai Botanical Garden, Xujiahui Park, People's Square Park, Gongqing Forest Park, Fuxing Park, Zhongshan Park, Lu Xun Park, Century Park, and Jing'an Park. The Shanghai Disney Resort Project is planned to be operational by 2016. It is a $4.4 billion theme park and resort in Pudong, which will have a castle that will be the biggest among Disney's resorts. The Forbidden City and the Temple of Heaven have their own parks. Other parks are scattered around Beijing. Some of the best are Zhongshan in Xicheng District, Beihai Park in Xicheng District, Chaoyang Park in Chaoyang District and Ritan Park in Chaoyang District. The Beijing Zoo in Xicheng District is famous for its traditional landscaping and giant pandas. Public awareness of the environment is growing, and the city is investing in a number of environmental protection projects. Air pollution in Shanghai is low compared to other Chinese cities, but still substantial by world standards. During the December 2013 Eastern China smog, air pollution rates reached between 23 and 31 times the international standard. Beijing has a high level of air pollution. The Beijing Environmental Protection Bureau (BJEPB) monitor and tracks levels of air pollution. Beijing became the first city in China to require the Chinese equivalent to the Euro 4 emission standard. Most Shanghai residents speak Wu Chinese. Many migrants from other areas of China that come to Shanghai for work speak Mandarin. A ‘local tongue’ has developed that includes a significant number of terms borrowed from European languages. People native to urban Beijing speak the Beijing dialect, which belongs to the Mandarin subdivision of spoken Chinese. Rural areas of Beijing Municipality have their own dialects akin to those of Hebei province, which surrounds Beijing Municipality. Shanghai boasts several museums of regional and national importance, such as the Shanghai Museum of art and history, Shanghai Art Museum, Shanghai Natural History Museum, and the Rockbund Art Museum. In addition, there is a variety of smaller, specialist museums. The "Shanghai School" was an important Chinese school of traditional arts during the Qing Dynasty and the twentieth century. Under the masters from this school, traditional Chinese art developed into the modern style of "Chinese painting". The best known figures from this school include Qi Baishi, Ren Xiong, Ren Bonian, Zhao Zhiqian, Wu Changshuo, Sha Menghai, Pan Tianshou, Fu Baoshi, Xie Zhiliu, He Tianjian, and Wang Zhen. Besides literature, Shanghai was also the birthplace of Chinese cinema and theater. China's first short film, The Difficult Couple (难夫难妻, Nanfu Nanqi, 1913), and the country's first fictional feature film, An Orphan Rescues His Grandfather (孤儿救祖记, Gu'er Jiu Zuji, 1923) were both produced in Shanghai. Shanghainese cultural artifacts include the cheongsam, a modernization of the traditional Manchurian qipao. In recent times Shanghai has established its own fashion week called Shanghai Fashion Week. It is held twice every year in October and April. Beijing or Peking opera (京剧, Jīngjù) is a traditional form of Chinese theater well known throughout the nation. Commonly lauded as one of the highest achievements of Chinese culture, Beijing opera is performed through a combination of song, spoken dialogue, and codified action sequences involving gestures, movement, fighting and acrobatics. Beijing cuisine is the local style of cooking. Peking Roast Duck is perhaps the best known dish. Teahouses are common in Beijing. The cloisonné (or Jingtailan, literally "Blue of Jingtai") metalworking technique and tradition is a Beijing art specialty, and is one of the most revered traditional crafts in China. Beijing's lacquerware is also well known for its sophisticated and intrinsic patterns and images carved into its surface, and the various decoration techniques of lacquer include "carved lacquer" and "engraved gold". Younger residents of Beijing have become more attracted to the nightlife, which has flourished in recent decades, breaking prior cultural traditions that had practically restricted it to the upper class. Shanghai is home to several professional soccer teams, including Shanghai Shenhua of the Chinese Super League, one of the China's most popular and successful. Other Chinese Super League teams currently based in Shanghai include Shanghai Dongya and Shanghai Shenxin. China's top tier The Shanghai Sharks of the Chinese Basketball Association developed Yao Ming before he entered the NBA. Shanghai also has an ice hockey team, China Dragon, and a baseball team, the Shanghai Golden Eagles, which plays in the China Baseball League. Beginning in 2004, Shanghai started hosting the Chinese Grand Prix, one round of the Formula One World Championship. Shanghai also holds the Shanghai Masters tennis tournament which is part of ATP World Tour Masters 1000, and the BMW Masters and WGC-HSBC Champions golf tournaments. Shanghai Cricket Club is a cricket club based in Shanghai. Beijing has hosted numerous international and national sporting events, the most notable was the 2008 Summer Olympic and Paralympic Games. Other multi-sport international events held in Beijing include the 2001 Universiade and the 1990 Asian Games. Single-sport international competitions include the Beijing Marathon, China Open of Tennis, ISU Grand Prix of Figure Skating Cup of China, WPBSA China Open for Snooker, International Cycling Union Tour of Beijing, 1961 World Table Tennis Championships, 1987 IBF Badminton World Championships, the 2004 AFC Asian Cup (football), and 2009 Barclays Asia Trophy (football). Beijing will host the 2015 IAAF World Championships in Athletics.